If you were unable to attend the recital given by the Cadran Trio on Saturday 29th April, you certainly missed a treat! Those present enjoyed playing of the highest standard in a programme which enabled the Trio to showcase a wide variety of musical styles, composed over two centuries from Haydn to Martinu, with Von Weber, Debussy and Villa-Lobos in between. 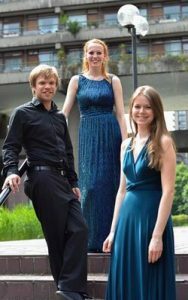 The Trio is comprised of Sophie Haynes, cello, Edward Liddall, piano, and Ruth Harrison, flute. There is local interest as Ruth attended Churchill Academy and won the Churchill Music Young Musician of the Year Audience Prize in 2011 and then went on to study at the Guildhall School of Music and Drama. She brought her trio back to Churchill as part of Churchill Music’s 25th anniversary and their tenth anniversary of Churchill Young Musician of the Year competition. All three members of the Trio are now professional musicians with impressive performance track records, but the audience was amazed to learn that having joined forces to form the Trio, this was their debut public performance. On the evidence of their ensemble playing on Saturday, they have a great future ahead of them as the Cadran Trio.